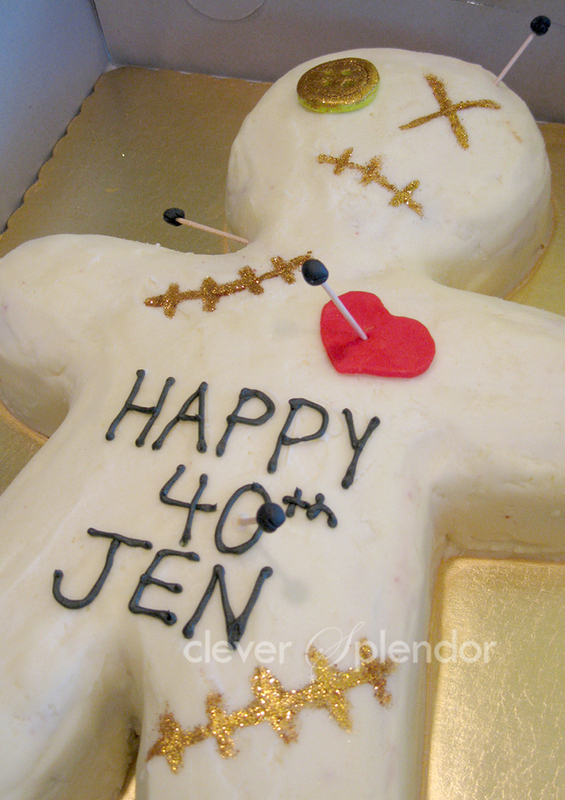 My art school friend Jen was turning 40 & I had the pleasure of making her cake - except it was the same day of my son's birthday! And as you only need scroll down to see, I go cazy on his birthdays. So to say I was busy was an understatement. The party theme was Mardi Gras/Voodoo so I knew the cake had to be a voodoo doll. I made my first secret board on Pinterest since Jen follows me. 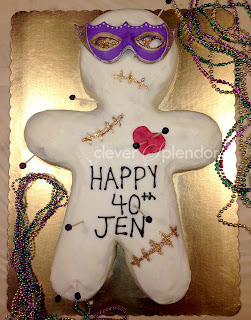 Here's the voodoo cake I saw & wanted to use for inspiration. I knew since it was not only Voodoo but Mardi Gras I needed to add in gold/purple/green and a mask. The mask is key I think - it definitely reminds me of Mardi Gras. That & beads of course, but there was no way I was making a ton of finicky gum paste beads. 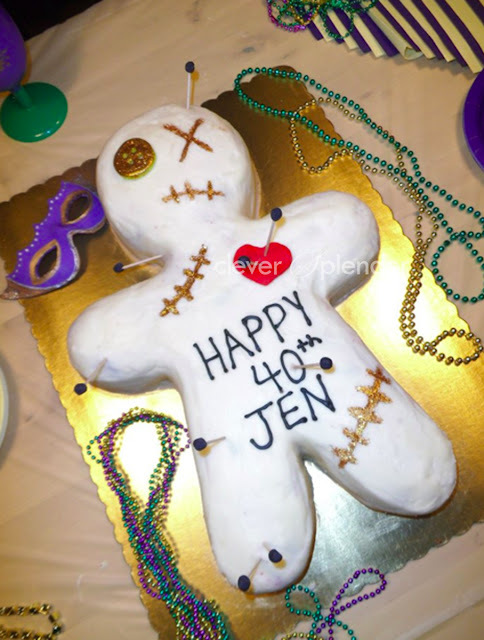 After some discussion with my friend Kelly, we decided a voodoo doll's guts should be red - because, as Kelly put it, we're all pink on the inside, right? Ha. So it was red velvet with strawberry filling and an amazing rum buttercream (had to do booze since it was her 40th, so in honor of New Orleans' hurricane drinks, rum it is). 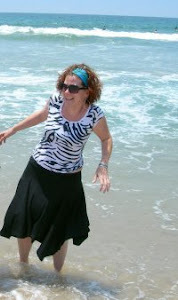 Here she is - I loved it! 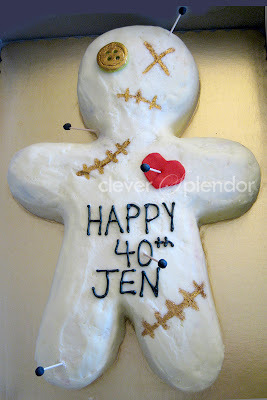 I used a cardboard stencil for the shape of the doll, then crumb coated. After that set up in the fridge, I did a thicker buttercream coat & used a knife dipped in hot water to smooth it out. 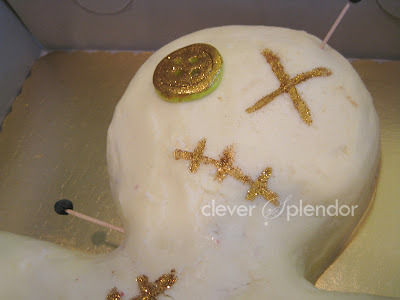 I've found that is the best way to achieve a fondant like look but with buttercream. 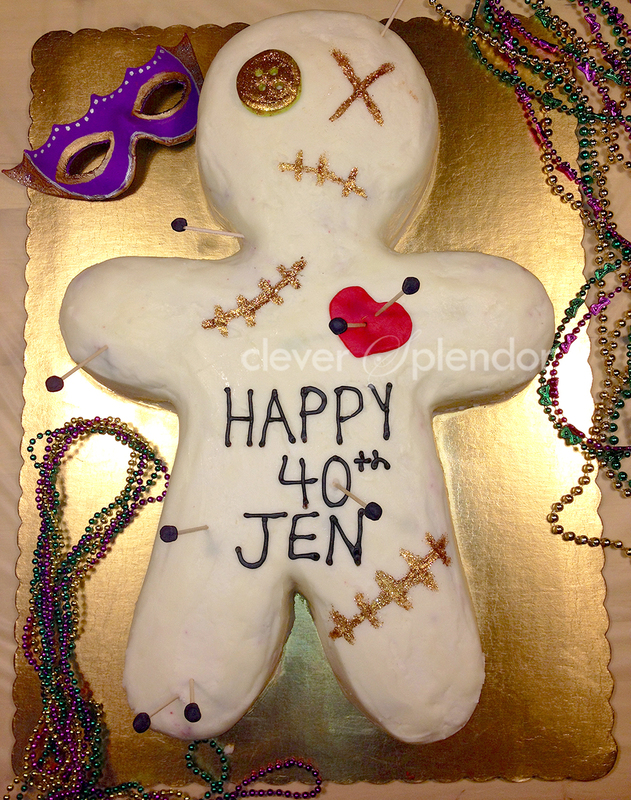 I used homemade fondant for the heart & button. The pins are toothpicks with gum paste balls. I made a few cardboard stencils for the stitches. I painted the cake through the stencils with water & shook edible Disco Dust over them. It was a little bit messy but the stencils definitely helped contain the glitter.